We’ve been mostly successfully growing our own fruit and veg this summer. I remember the back of our garden having a wonderful allotment as a kid, shelling peas and picking runner beans so wanted to try and continue that. We’re pretty restricted to pots in our current house, as digging up the garden will be more hassle than it’s worth (and daddy bought a giant trampoline that swamps the garden! ), so we’ve kept it small. Plus, working full time and pregnant with no 2 it’s proving hard. These are our best crop. I bought a £1 seed pot from wilkinsons and planted on the windowsill in our kitchen. Within a short while, we had nine or ten shoots and I separated out and kept growing. They’ve slowly been growing, and having given three plants to a friend, we now have three massive bushy plants in two pots, and a third pot with one plant that looked as if it would die but seems to have recovered. Three plants died- I think I had a dodgy bag of soil as they just became waterlogged. The tomatoes did ripen, so we had a few. Baba has loved picking the ‘pomatoes’ and gets very excited helping, tying up and picking the ripe ones usually consumed straight away! 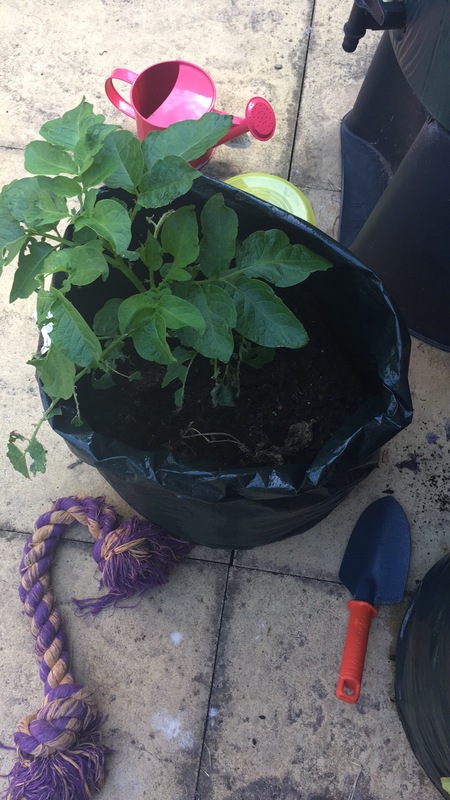 Bought a cheap plant from Morrisons, planted out and kept fingers crossed. Initially it didn’t do too well, but then suddenly started blooming. Some fruits appeared, or what looked like fruits but soon disappeared so figured we wouldn’t get a crop this year. 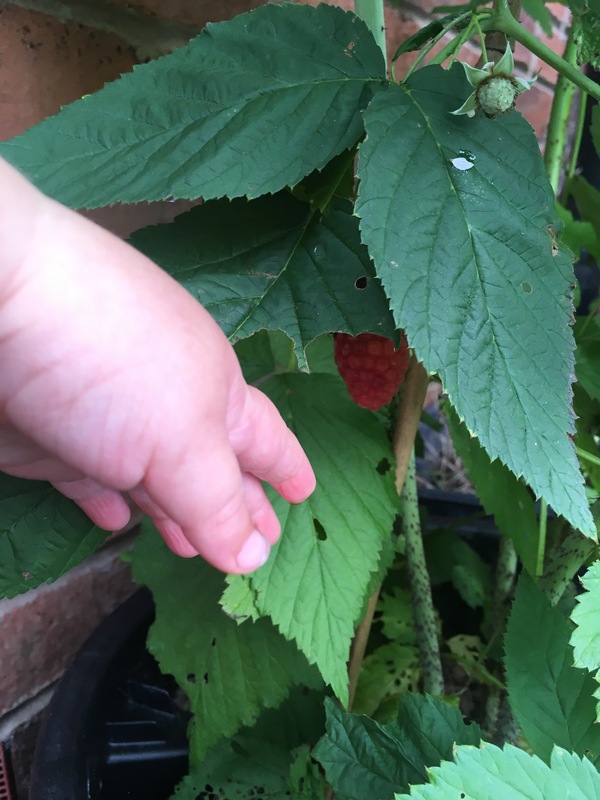 Imagine our surprise when I had a quick look and discovered two raspberries! The delight on baba’s face was amazing (particularly after strawberry gate, see below) as we eat our ripe fruit. I just need to work out what I’m doing now with regards cutting back and wintering. The strawberries were growing well, produced some beautiful fruit. I was in the kitchen when a distraught baby appeared. ‘Mummy…. (the dog) eat my strawberries’. Bought a net and covered the growing ones. Two days later, same thing. So no strawberries this year. Transplanted some plants so hoping for a better, dog protected crop next year. 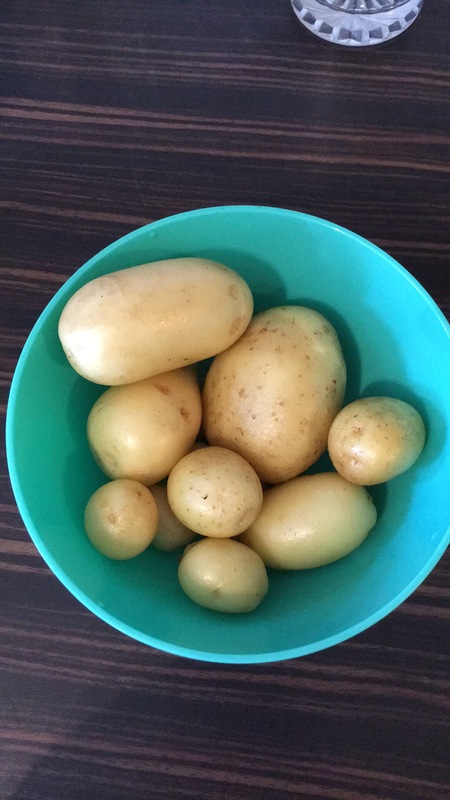 Bought some seed potatoes and had five lovely plants shoot up. Beautiful bushy plants…until the slugs got them. Bought some wool pellets which stopped them for a while but eventually they got the lot. Dug up the bags and was surprised to find a few had survived, very happy half an hour spent getting messy searching through the soil. This didn’t survive. Not sure what we did wrong but just suddenly died. We’ll try again next year. My mother in law gave me some cuttings of mint and rosemary and initially they didn’t look too good. End of summer and they’re overflowing! Beautiful cooked in bolognese and will make a mint sauce soon as it’s growing so well. Attempted to take a cutting off for my mum and so far it’s going well. I’ve loved having a bit of a garden mostly although the slugs have made it hard. We tried wool pellets but think I’ll try copper tape next year as the wool pellets don’t seem to last too long and just macerate the plants, plus smell after a while! Here’s hoping some last through the winter.